-Muscular weakness of the back/abdominal muscles. -Reduces load on intervertebral I disc (L1-L5). Regular, 28in - 50in (71 - 127cm). Plus Size, 50in - 70in (127 - 177cm). At Mueller, we know the importance of integrity, pride and excellence. These elements are embodied in the way we run our business and the products we sell. 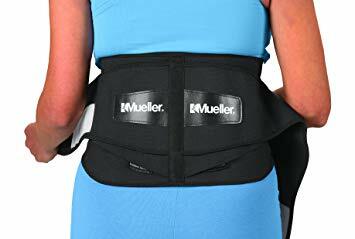 For more than 50 years, Mueller has been committed to providing the best quality sports medicine products to consumers around the world. I have never felt compelled enough to write a review but this back brace made something that hasn't been possible in about 10yrs actually possible. 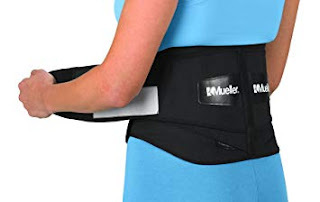 I have had back issues for about a decade and not one Dr has suggested a back brace. I am only able to walk for about 45min before the pain is unbearable. I love amusement parks but I have to rent one of those electric carts and it truly ruins the experience. On a whim I decided to try a brace out. I recently took my family to a large amusement park and about 2hrs in I realized that I was still walking and in what I would describe as completely bearable pain. It was about 95* and I was saturated with sweat and the brace never moved! I did readjust twice but like I said I have never used one before and figuring out the best position took a couple tries. We wound up being there from 9am-3pm I was able to enjoy the entire day walking around and on rides! Since this experience I have started to use it to be able to go on walks, shopping even just grocery shopping. I can finally enjoy/tolerate even the little things. I have NEVER written a review before but I felt I would be doing my fellow consumers an injustice if I didn't. Highly Recommend, but 40 inch waist-line max. 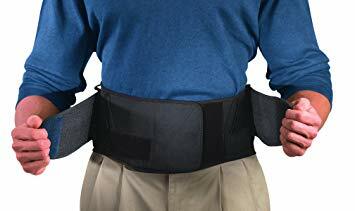 Well I've been wearing this brace for some 5-years now, so as to protect my back during heavy lifting, and while square dancing, etc. And during that time period, it has helped me immensely, along with thankfully zero set-backs. But unfortunately, it's now looking a bit worn & shabby, so I ordered a replacement. And of course my original brace also stretched out approx. 5-inches during those 5-years, while I in turn added several inches to my waistline. The real problem being that the replacement brace doesn't fit my current 42-inch waist, even though it's range is supposed to be from 28-50 inches. Yes, I can get it on, but without being able to move or breath. 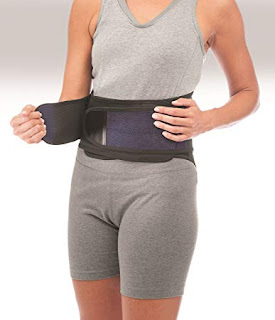 But because I like this brace so-much, I decided to take a chance and I ordered the plus sized brace (50-70 inches), which unfortunately was far too large. My overall point being that if your waist-line measures in the 40-50 inch range, you really should be shopping elsewhere, just like I will be, trying to find something equivalent in quality, that also fits. 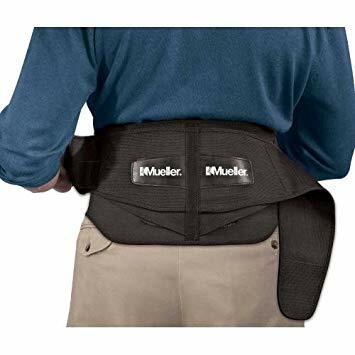 No idea why Mueller doesn't offer an in between size, which they really need to. Only wish I bought this years ago. Great, wide back support. I have a few others, but this one is the widest. It sites nicely between the hips and the rib cage. The Lumbar lump/pad in the middle does nothing for me. 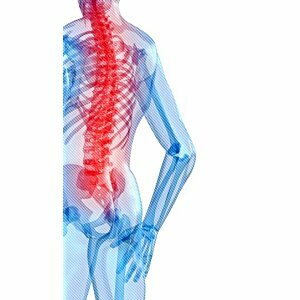 There are 4 stiffeners on either side of the spine, and if you put it on tight, it will keep you upright. Noteworthy is that when sitting in an office chair with this brace, posture is remarkable. Other back braces I have used allow me to slouch in the chair, but not this one. The width is what keep you nice and upright. Herniated discs, in my case, need perfect vertebrae alignment to manage pain. 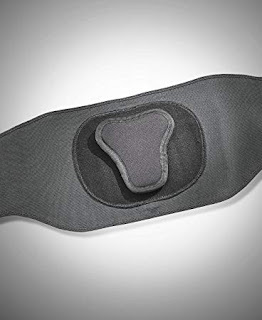 I ordered the 28 - 50" size, and I'm 38" waist, 6'0" male. Fits fine, and you can really snug it up. 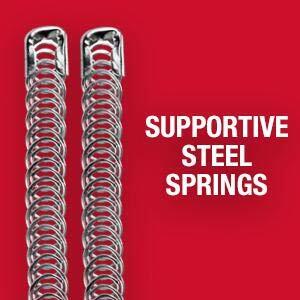 The hook/loop fasteners are remarkable too when new. Once you position the elastic bands, they really stay put...and it takes a good bit of effort to free yourself. Since it is very wide, anyone shorter than 5'6" should probably have a test run...it might be too wide, and sit either too far up or too far down. I work as a Paramedic, so my back faces frequent strain in all kinds of unpredictable ways. One minute I may be carrying a patient down a flight of stairs, and the next I'm fighting off a dozen ninjas (Are you a paramedic? No? Okay then.) Talk to five people who have been in EMS for a long time. I promise at least one (and probably more) has chronic back problems. I was recently out of work for 15 days with a lumbar strain. During lifting and totally real ninja battles, I need support for my back, but without sacrificing range of motion. I also need to wear these for the entirety of a 12+ hour shift, so comfort is a must. I will never wear another lumbar support. This one is perfect. It is very comfortable and provides very even pressure across the back, sides, and belly. It is not noticeable at all between my undershirt and my uniform shirt. putting it on and taking it off are perfectly easy (but the velcro is LOUD. If you have a sleeping spouse or kids you may want to wait until you get to work to put it on.) There are no complicated adjustments, just pull the elastic until you feel there is enough pressure. I've been wearing it every day at work for about two months now and I have had no problems at all. It has never impeded my movement, or hurt in any way. Take it from someone who has unrealistically high standards (and needs) for a lumbar support. This is the one to get.